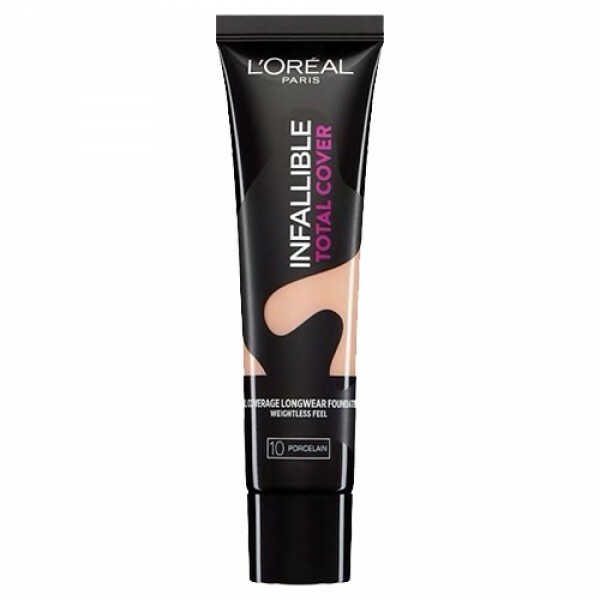 Infallible Total Cover is a full coverage foundation for both face and body. This high coverage foundation will provide 24hr of long lasting coverage and is available in a range of shades. Ultimate spreadability and even full coverage thanks to the Camo-Stretch Technology. An exclusive long lasting foundation that provides 24hrs of full coverage, with an ultra-light-feel. This foundation covers a large range of imperfections without overloading: redness, marks, dark spots. Zero cakey effect. No transfer. Non comedogenic. Apply Total Cover Foundation with a foundation brush for the best result. AQUA / WATER, DIMETHICONE, GLYCERIN, HYDROXYETHYL ACRYLATE/SODIUM ACRYLOYLDIMETHYL TAURATE COPOLYMER, DIMETHICONE CROSSPOLYMER, SYNTHETIC FLUORPHLOGOPITE, PHENOXYETHANOL, DISODIUM STEAROYL GLUTAMATE, TRIETHANOLAMINE, SALICYLIC ACID, ALUMINUM HYDROXIDE, SORBITAN ISOSTEARATE, POLYSORBATE 60, [+/- MAY CONTAIN CI 77891 / TITANIUM DIOXIDE, CI 77491, CI 77492, CI 77499 / IRON OXIDES.